You are looking for a property for rent in Santanyi, or have a question regarding our real estate offers in Mallorca? You were not able to find the ideal finca in Santanyi? Then please call us on +34 971 698 242, or send us an email to info@portamallorquina.com. Our Porta Mallorquina real estate agents in Santanyi will be pleased to asist and will help you find your dream property. Santanyí in the southeast of Mallorca is among the most popular villages of the island and has resisted over centuries Romans, Arabs and pirates. The beautiful small city with its golden façade of sandstone is elevated from the green surrounding and attracts tourists as well as residents on Wednesdays and Saturdays to the colourful weekly market. Around the Plaza Mayor, there are various cafés and restaurants offering a broad culinary selection. The surrounding narrow streets with beautiful shops invite you to stroll. Two newspaper shops have foreign publications in the morning of same day magazines, and can reserve for pickup. Gothic cathedral offers regular mass. Supermarkets are located on the outskirts. The natural preserve of Mondragó is nearby offering numerous routes for hikers, whereas the idyllic bays at the east coast, as Cala Santanyí or Cala Llombards are perfect for bathing. The harbour of Portocolom and the golf course of Vall d’Or are at a short distance. Es Llombards, a sleepy town 1km from the house, has four restaurants, three small cafes/bars, and two bakeries. Ses Salines, 2km from the house, has restaurants, cafes, a church, supermarket, a street market and a vet. Manolo´s seafood restaurant is particularly popular with locals and foreigners. Colonia San Jordi, 8km from the house, is a traditional beach town which has benefitted from increased tourism. Waterfront restaurants, cafes, bars & shops. It has several beaches and a marina. Great for evening strolls. Ses Salines Faro (Lighthouse): 8km from the house, beautiful for long walks along the coast and the small beaches; can walk all the way to San Jordi. 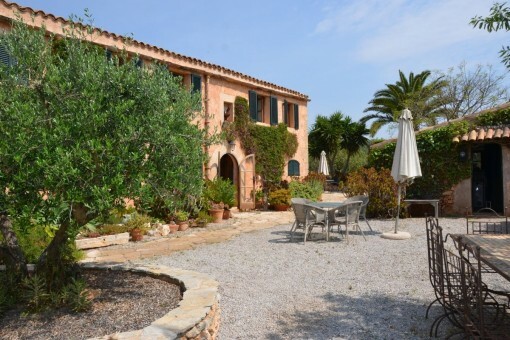 you are reading: Santanyi long term rental: properties in Santanyi to rent · Porta Mallorquina Real Estate Rating 4,8/5 by 200 testimonials.